Update 2: iOS 4.2 download is now available for iPad, get it now! 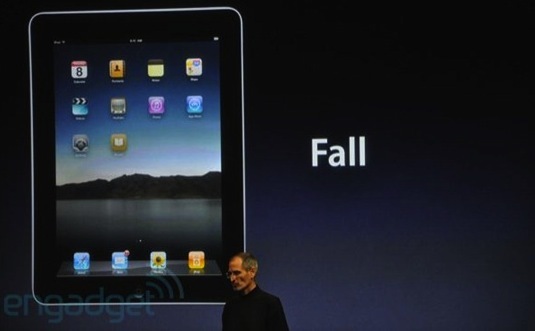 Update: iOS 4.2 for iPad has been confirmed by Apple to be available in November. This will be the unifying iOS 4 release across i-devices in Apple’s product lineup, and it will bring many new features to the iPad such as multitasking, folders, AirPlay, print support, and more. If you own an iPad and you want to run the latest version of Apple’s mobile iOS, you’ll have to wait a few more months. A report from AppleInsider looks to confirm the release date of iOS 4 for iPad as November of 2010, this is in line with Apple’s statement during WWDC that OS4 will reach iPad in the Fall. iPad owners have been left out of the recent release of iOS 4 with it’s new features, as Apple readies an iPad specific OS build for the device. Polls indicate that most iPad users want multitasking and folder support the most out of iOS 4, but due to Apple splitting the builds they’re not missing out on all of the features of the newer OS. The current version of iOS 3.2 supports the use of a bluetooth keyboard with iPad, which is a feature that otherwise is only in iOS 4 for iPhone and iPod touch. Reports indicate that when iOS 4 reaches the iPad, it will come as iOS 4.1 and it will finally combine the differing iPhone and iPad builds of iOS into a single unified operating system. Updated iPad coming in Fall? Could the release of iOS 4 for iPad coincide with the release of an updated iPad? That’s what some in the rumormill are suggesting, and it doesn’t seem too unlikely considering the current iPhone 4 has features that the iPad doesn’t; most notably twice the RAM at 512MB, dual cameras with FaceTime support, and the stunning PPI & screen resolution of the Retina display. With these prominent feature differences, an updated iPad alongside the update iOS would bridge the hardware and feature gaps of the two devices. Update: Rumors continue to circulate about a new iPad with camera and FaceTime compatibility coming in the Fall. I don’t think that a new iPad will be released until next year, but the next model will be much like it is now but with updated RAM and possibly storage. I think that the iPad will follow the same development as the iPod Touch, sometimes ahead and sometimes behind the iPhone. But I do think that there is very little wrong with the iPad, I don’t want a camera or need a higher resolution screen. It is always the same with Apple kit, everyone always wants more from them, high resolution, more memory or a battery that lasts seven days on continuously. I don’t care what they add if they don’t add Flash my next similar device will not be an Apple. I don’t understand why this is not part of the discussion. I don’t care what Steve’s lame reasons are…Flash is on the Web, get on the boat!!!! I’m starting to call mine the iLame. I don’t forsee the iPad getting a retina display for at least a year. Never mind whether or not these screens are even available at that size in quantity, even Apple isn’t going to ask 3rd party developers to re-release their iPad apps with new artwork @ 4x the current resolution within 6 months of the original release. Now, iOS5 for iPad.. yeah, can totally see retina display on it. If anything, I imagine Apple will update the upsizing function for iPhone apps to smooth rendered text and take advantage of higher res art in iPhone 4 optimized apps. I think it would be pretty ducky if Apple comes out with a new iPad with all those fantastic upgrades so soon after so many of us just got an iPad! Apple, think how that’s gonna make a lot of your customers feel. Yes, I would love to have all that stuff you are talking about, but I won’t. I’ll just feel screwed! Apple do have to come up with the new ipad, blackberry, samsung and others are coming with new slate that have all is missing in ipad(usb, camera etc…) if they dont they will lose markette share… And this is more dangerous for them than you beeing unhappy..